Model 14BCF (burrs, clamp, flywheel) This is a special order promotional item and there will be a 50% restocking fee for all cancelled or returned mills. Shipping time on this item anywhere in the world is about 10 days. This promotional Package Includes Uni-Ark Mill In White Only with the following components This unit comes complete with a. Steel burrs b. Table clamp c. Cast iron Flywheel This beautifully 100% USA engineered mill was originally designed and made in our factory back in 1982. It has a long life, permanent oil impregnated bearings. This mill has the ability to be interchanged with either the stainless steel wheels and ceramic stones. The body is a white powder coated, one piece, die cast, ultra light air craft technology aluminum. The 356 aluminum is USDA approved. 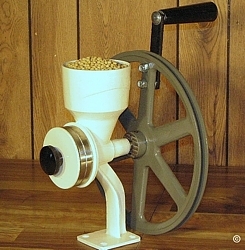 The Uni-ark is a top of the line hand mill. Grinds approximately 1-2 cups of fine flour every 5 minutes. About three times faster when purchased with the flywheel and motorized. Much faster on coarser setting or when steel burrs are used. Uni-ark contains no cheap plastic parts, loose springs and key ways prone to get lost or broken during use or dis-assembly. With the permanent grain funnel attached to the main mill body, the single foot supports the weight of the unit. With the exception of the permanently attached funnel and a single foot, it's design is nearly identical to the Little Ark. Most of it's parts are interchangeable. The body of the mill can be either permanently attached to a solid surface or temporarily clamped on to the table using our non-abrasive table clamp A motorizing kit is available. Lifetime warranty to the original purchaser. Hopper size is 1.5 quarts. Dimensions: 14 inches high, 6”wide, 7 1/2” deep. Grinding wheel diameter is 4 inches. Owner's manual is included. Shipping weight is 20 pounds. Free shipping on this item if paid with a check or money order. All our products are made in USA. Due to our strict quality control standards and supplier manufacturing deadlines our delivery time may vary depending on which color and item you select. The standard delivery time on all our products, repairs and special order items is 2 to 8 weeks at this time. Please call us at 208-254-3737 during our regular business hours before placing your order to find our current delivery schedule is at this time.